and the health of the natural world. protecting against environmental factors and hazards that might have a detrimental effect on individual physical, mental and social health, well being and development. There is a lot of talk these days about "the greening of our schools." Some schools are jumping in headfirst and see the need for change. Other schools are not quite there yet, and are waiting for things like funding, parent buy-in, and community support. The truth of the matter is that we can wait no longer! Our students, our teachers, our staff, and our planet are not as healthy as they could be, and it is our job to do something about it! Environmental health also implies educating people to prevent them from affecting the environment in such a way that it, in turn, will adversely affect their well being and development and the health of future generations. "Environmental health addresses all the physical, chemical, and biological factors external to a person, and all the related factors impacting behaviours. It encompasses the assessment and control of those environmental factors that can potentially affect health." We should always be looking for opportunities to teach environmental health, no matter what grade or subject we teach. And we should always be on the lookout for elements in and around the school that might be unhealthy for our students. An immediate example that comes to mind is the amount of idling that still happens outside many schools. Parents love their children and would never knowingly poison them. But every school day, millions of parents pull up in front of schools and leave their engines running while they wait for their kids to be dismissed. information on the costs of idling. 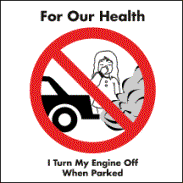 Car exhaust is a major contributor to global warming. So not only does it kill now (see below), but because carbon dioxide remains in the atmosphere for such a long time (about 20% of it remaining for 1000 years, radiating heat the whole time), today's car exhaust will continue to kill into the future. Car exhaust also spews out a noxious combination of toxic chemicals and particulate pollution that can seriously impact our health, and especially the health of our younger students (who are particularly vulnerable to air pollution — a "susceptible sub-population" — because they breathe faster than adults and inhale more air per pound of body weight) and those with asthma. Once breathed in, these substances are transported through the bloodstream to all our major organs, causing respiratory and coronary problems, and, fairly recently discovered, diabetes. 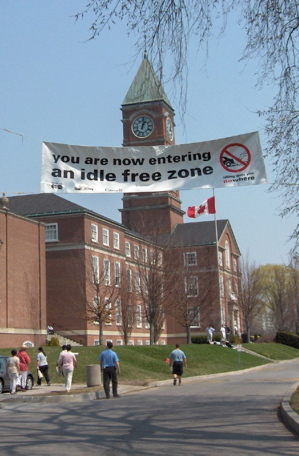 Check out this Proud to Be Idle-Free article to read about the idle-free zone campaign at the school where I used to work. 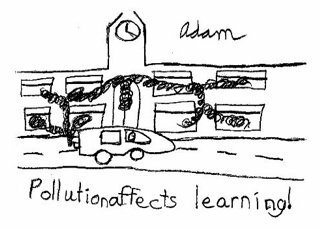 I found that students in grades 4 to 6 were especially passionate about doing the necessary research, making videos and presentations, drawing anti-idling cartoons, and asking parents and other visitors to turn off their cars. Students can work together with other members of their families and school communities to ensure their schools, play spaces and homes are safe and healthy places for them to learn, play, live and grow. While the term "environmental health" applies to the wellbeing of humans, "ecosystem health" applies to local and global ecosystems. If ecosystems are unhealthy and unable to remove natural and human-made pollutants from the air, land and water, then our environmental health suffers. Healthy ecosystems are characterized by resilience and productivity. Ecosystem health refers to ecological integrity — the ability of ecosystems to maintain stability, complexity, diversity and capacity for self-organization. In 1942, Aldo Leopold described it as "nature's capacity for self-renewal." It's probably easier to picture "ecosystem illness" than ecosystem health (perhaps because many of us have never studied ecology). Think habitat destruction, deforestation, drained wetlands, desertification, invasive species, contamination. Picture all the woods, meadows, streams and creeks that have been cut down, filled in or otherwise ruined for the sake of barren asphalt "playgrounds" or easy-to-mow green deserts of grass. But children need green spaces and "wild" places in order to thrive physically, mentally and emotionally — not to mention, in their spirits — and most schoolyards just don't cut it. 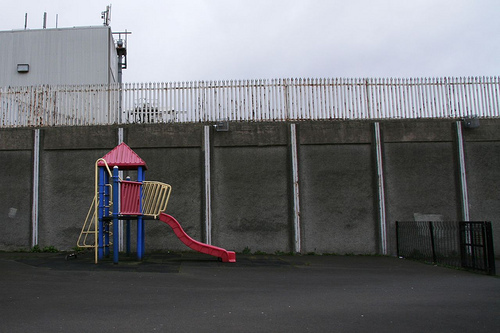 We create flat, lifeless playgrounds to make our lives easier (supervision is easier, maintenance is easier), but we're imprisoning our students in wastelands that can't possibly kindle their connection to Nature. (Which can lead to a "barrenness" of spirit, which leads to discipline problems, which makes our jobs tougher, which ....) Children deserve to spend time with their brothers and sisters and friends of other species. Would you want to spend your recess and after-school play time here? A great way, then, to teach ecosystem health and respect for the Earth is to naturalize your schoolyard. Pick a small project each year, and before you know it, your students will be able to play in the butterfly garden, learn in the outdoor classroom, or spend a quiet recess break in the food garden. All human institutions, programs, and activities must now be judged primarily by the extent to which they inhibit, ignore or foster a mutually enhancing human-Earth relationship. connected with the rest of Nature.